caused by her father’s ire, or her mother’s castigation. Their home life was a parody of what a life should be. He surveyed his daughter mainly from afar. The only time she deigned to talk was to usurp the car. She was so disrespectful he could barely hold his tongue. 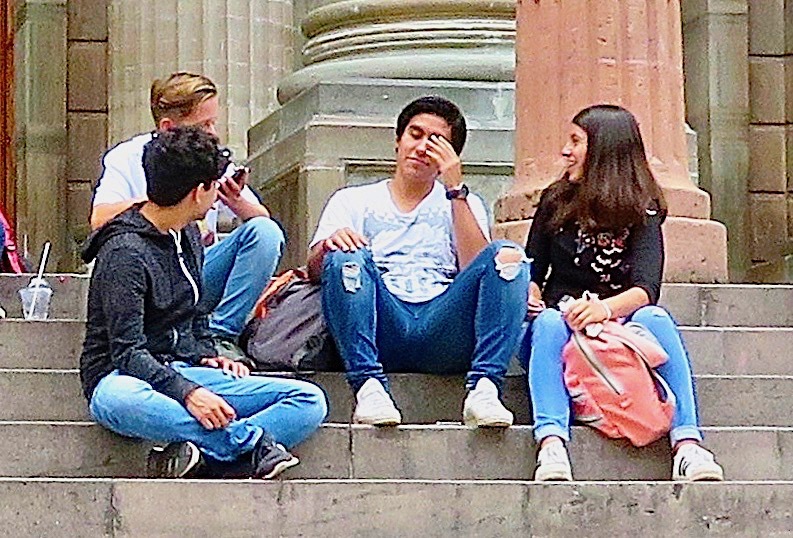 Why was it so difficult to converse with the young? She’d thought she’d have a daughter to fuss over and dress. her daughter lately gave no sign that she had once adored her. Rather, all the indications were that she abhorred her. Her mother dressed in mom jeans and her dad tucked in his shirts. Then looked askance when she appeared in bandeaus and short skirts. When they tried to speak her language, it only caused distress. TBH, they had not a clue, and she could not care less. This is the modern family. The parents sorely vexed. The daughter is embarrassed, her mom and dad perplexed. that seems to be missing in this modern generation? that they once felt for parents back when they were teens. This disdain from their daughter was passed down in their genes. This too shall pass, I’d like to say. Give it a little time. The year will come when being parents will not be a crime. Her growing up and having kids will be the end of it. You’ll be her heroes once again when you can baby sit! Words of the day are quench, parody and castigation. This entry was posted in Family, family relationships, Fathers, Humor, humorous poem, Mothers, Mothers and Daughters and tagged Family relationships, FOWC, humorous rhymes about teenagers, poem about a family, poem about teenagers, RDP, Word of the Day on November 12, 2018 by lifelessons. she could have answered, way back then? the details all rehearsed and frozen. the underside that she forbid. We would laugh and joke and kid. always helpful in a bind. although, I fear, I did not know her. and favorite sister. Was she sad? simply let the subject be. what were the details and the wherefore? empty of people and of trees? Was she lonely? Did she have friends? and went on home, angry and bitter. Did my father come to get her? were hinted at but never told. to display unhappiness was sin. To please her, we followed the rules. withheld them from our family. my parents, generous and brave? we reminisce about back then. my thought about my family. we’ll ever know the answers now. I am still looking for another. This entry was posted in Family, family relationships, Family Storie, Mothers, Mothers and Daughters and tagged Daily Post, Daily Prompt, Family relationships, family secrets, Mother, NaPoWriMo 2017, Pleased, portrait of my mother, portrait poem, rhyme on April 12, 2017 by lifelessons. I am the emperor of chocolate. I conquer every bar. I can detect its presence in wrappings or in jar. When there’s no chocolate to be found, I simply can’t abide it. I can find it anywhere—wherever you might hide it. but I cannot help it, for it’s congenital. 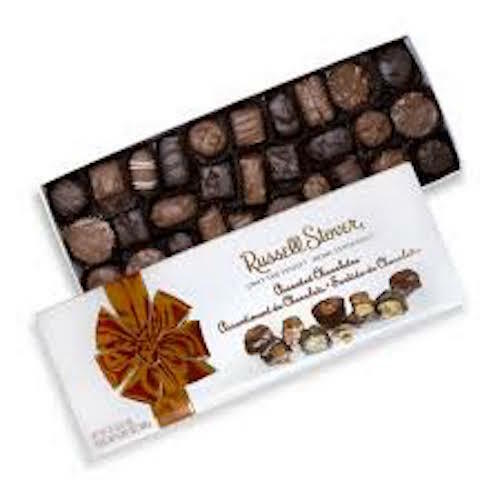 My mother abused substances—namely, Russell Stover. She could not close the box lid until eating them was over. when it came to other foods like hamburgers or mutton. on her birthday and for Christmas, and for sure on Mother’s Day. for when it came to chocolates, she always just inhaled them. One time my dad decided that he would have some fun. He bought my mom some chocolates to dole out one-by-one. to give her one piece daily, but she knew that they were there. She ate the whole box in two days. It really was disgraceful. Every time I saw her, it seemed she had a face full. of every chocolate she stole. My father never knew. She was not tempted by the cherries—a taste she could eschew. although I’ve always known that the true jokester was another. she’d say, “I’ll save it for later,” or sometimes she’d demur. and I was fully loyal to preserving mother’s fable. because the chocolate-covered cherries? She gave them all to me. The prompt today is conquer. This entry was posted in humorous poem, Judy Dykstra-Brown poems, Mother, Mothers, Mothers and Daughters, Poem, poem about families and tagged Daily Post, Daily Prompt, Family, family stories, Fathers, funny poems, Mother, mothers and daughters, Poems about families on March 19, 2017 by lifelessons. I imagine one more holiday. she takes her shoes off to walk through packed sand. over and over into the waves. and most of those times have been with me. its black hairs caught in her diamond rings. as we had never played before. with me as the guide rope in between. My mother, me, a dog or cat. Wind to bundle up for and to walk against. Wind to turn our ears away from. with a crab’s claw at the top. The bones of my mother. The dreams of me. regrets over trips to the sea we never made. And I’ll imagine taking me to oceans. Walks. Treasures hidden in and hiding sand. and a dog chasing sticks. 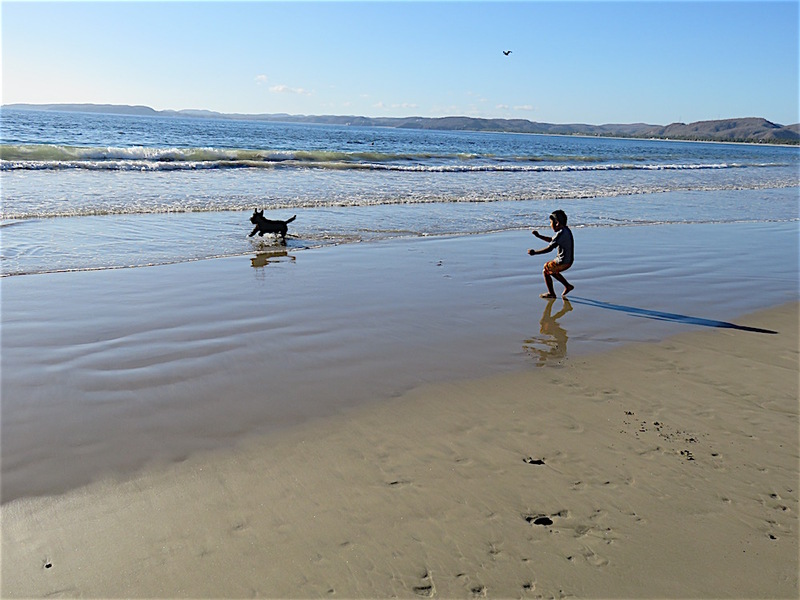 Note: I never took that last trip to the ocean with my mother, but I think of her every year when I come to stay at the beach on my own, and this year in particular, every time I throw the stick for Morrie and every time children come to play with us. Here is a link to my favorite photo of my mother, plus other stories and poems about her. Written for the dVerse Poets prompt, Prose Poetry.To play along, go HERE. This entry was posted in beach poems, Judy Dykstra-Brown poems, Mother, Mothers, Mothers and Daughters, Poems about women, Sad Poems, Uncategorized and tagged Beach images, beach poems, dversepoets, family memories, favorite memories, Mother, mothers and daughters, poems about mothers, regrets on March 2, 2017 by lifelessons. My mother and Scamp in an uncharacteristic upright position. Note reading material to their right. My mother would have been the first one to say that she was lazy. To be fair, this wasn’t true. I had seen her iron 32 white blouses at a sitting—her at our large mangle, running the fronts and the back of the garments, then the sleeves and collars through the large rollers, my sisters or I then taking our turns ironing the details near the seams and around the buttons. We had a regular assembly (or wrinkle de-assembly) line going every Saturday morning. She cooked every meal and kept the house reasonably clean. But on weekends, she was the commander and we were the workers. One vacuumed while the others dusted. We were the window cleaners and the front walk sweepers, the table setters and dish washers when school or social activities allowed. But there were times when a good book consumed each of our interests to a degree that weekend chores were lost in a blur of fantasy–each of us in thrall to a different book–my sisters in their rooms or on beach towels spread out in the sun of the back yard, me on on my back on the porch roof just outside my older sister’s bedroom window, and my mom flat on her back on the living room sofa. Or sometimes it was the same book–taking turns reading 9-year-old Daisy Ashford’s memoir “The Young Visiter” [sic] as the rest of us howled–holding sore stomachs, tears running down cheeks. At times like this, a week’s clutter might sit untouched on surfaces, that morning’s dishes still in the sink, last night’s shoes still lying like rubble in front of the t.v. or half obscured beneath piano bench or assorted chairs around the room. In short, housework, although generally done weekly, never got in the way of activities or a good book. 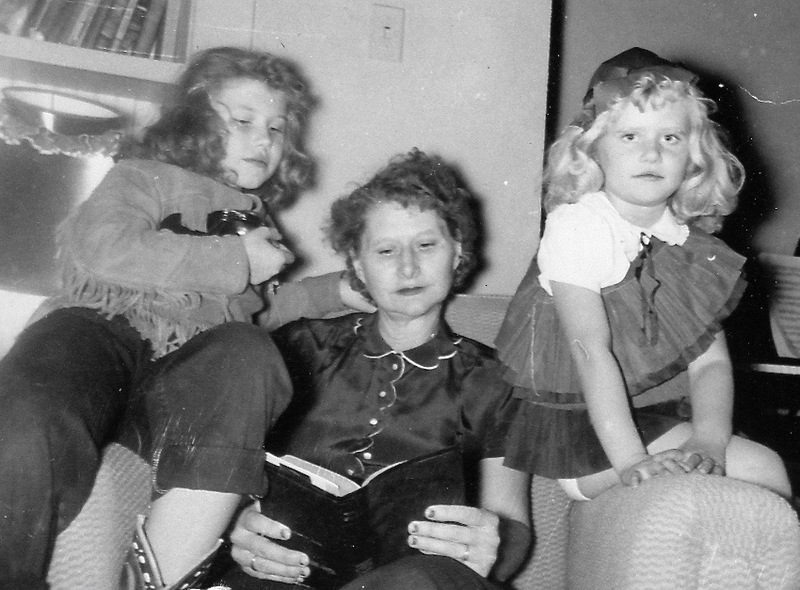 We were a family of readers, and generally this reading was done on our backs. 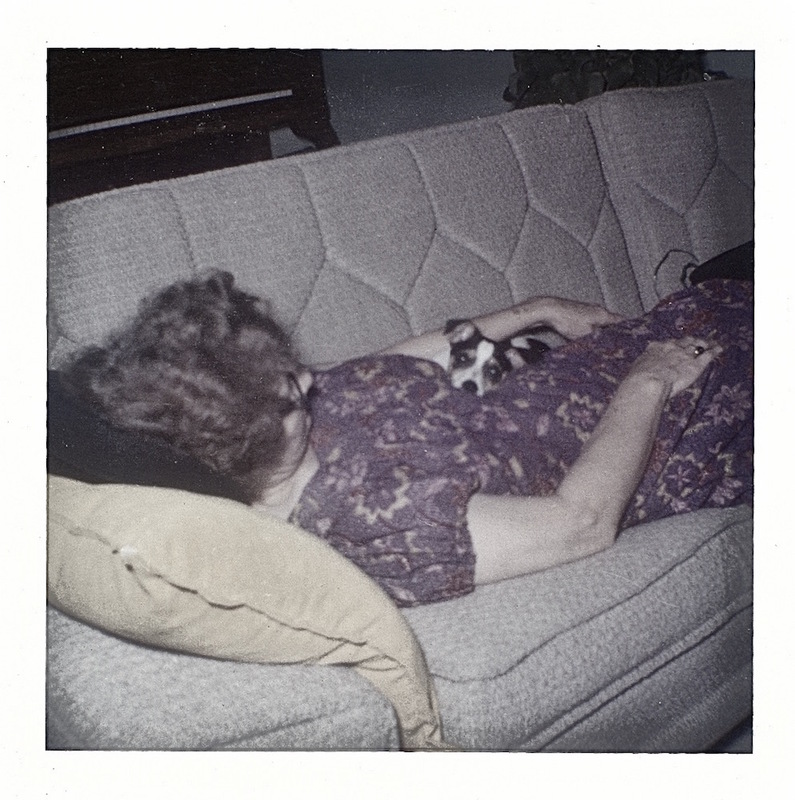 My mother’s spot was always the living room couch–some family pet (a tiny rabbit or raccoon, kitten, or the family terrier, Scamp) spread out between her side and the divan, my dad in “his” comfy rocking chair, feet up on the foot stool. I loved my bed or the floor or in the summer, outside under a tree. My older sisters’ bedrooms were sacrosanct. A closed door meant privacy. No one entered uninvited. This was in an age before computers, cellphones, or other texting methods. The one telephone in our house was on the kitchen wall or counter. It was a party line in more ways than one. Not only were our conversations held within earshot of the entire family, but also could be “overheard” at will by the two neighborhood families who shared our party line. Today’s technological wheel had not yet been invented. With no TV possible until I was 11, I spent a youth devoted to two things: my immediate surroundings and the people or book readily within sight. If company was called for, it walked or drove to you or you drove or walked to it. The rest of life was family, homework, housework, play or books, and my mother, luckily, considered the play and books to be equal in importance to housework. “I’m basically lazy,” she always said, but I must repeat again that this was not true. Our house usually assumed a state of more or less perfection at least once a week. It is unclear the degree to which this was motivated by my oldest sister, who was an excellent commander. “Mom, we’ll do the dishes. Patti, you wash and Judy you wipe,” she would instruct, while she herself disappeared into her room for an after dinner nap. I do remember a certain Saturday when each of us lay on her back or sat sprawled in a different chair reading when a knock sounded at the front door. Impossible! No one in our small town ever dropped by uninvited. Even sorties to or from my best friend’s house just two houses away from me were always preceded by a phone call. We remained silent, but the insistent knocking continued. I peeked out at the front door through the living room drapes and the eyes of two girls and an older woman all shifted in unison towards the drapes. Caught! Each of us grabbed a different pile of garments, books, shoes or ice cream dishes from a living room surface and stashed them in a closet, drawer or cupboard as my mother answered the front door to a woman and her two daughters from a neighboring little town, just 7 miles away. They had dropped by because they were building a new house and had been told by my dad that they should stop by to see our house, which had been built a year before by a builder they were considering. My sisters and I stayed a room ahead as my mother s-l-o-w-l-y showed them the house. I cleared dirty dishes from the last meal into the stove as my sister hastily made beds and tossed dirty clothes into closets, sliding them closed to obscure reality as the visitors probably wondered what all the banging closets and drawers were about. This was not the norm. All of Saturday morning was traditionally spent cleaning floors, dusting my mother’s salt and pepper collection, neatly piling stacks of comic books on the living room library shelves, washing windows, straightening kitchen shelves. We were not slovenly, but neither was my mother a cleaning Nazi. Life and literature often intervened. Now, more than fifty years later, my mother has been gone for 14 years. One sister has been lost to Alzheimer’s, the other is the perfect house keeper my mother never was. But every morning, I lie in bed writing this blog until it is finished. My favorite location for reading is still flat on my back, and I do not need to compete with my mother for my favorite reading spot on the living room sofa. Sometimes Morrie, my smallest dog, spreads out beside me, and I can’t help but think of my mother–feeling as though I’ve taken her spot–stepped into the role set for me by the preceding generation. Yes, the day’s dishes lie stacked in the kitchen sink. There are books piled on the dining room table from Oscar’s last English lesson. Papers are piled on the desk next to my computer, a pair of shoes under each of several pieces of furniture. Bags of beads and Xmas presents purchased during my trip to Guad a few days ago are still on the counter, ready to be whisked off to cupboards or the art studio below. But my book is a good one and Yolanda will be here tomorrow, bright and early, looking for tasks to justify her three-times-a-week salary. With no kids of my own to boss around or delegate bossing authority to, and salaries cheap by comparison here in Mexico, I have hired myself a daughter/housekeeper/ironing companion. Sometimes we stand in the kitchen and talk, letting the dust remain undisturbed on surfaces for ten minutes to a half hour more, or go down to the garden to decide where to move the anthurium plant, to just admire a bloom I’ve noticed the day before or an orchid recently bloomed that she has noticed in the tree I rarely glance up at. Every generation cannot help but be influenced by the last, and in spite of many differences, I am still my mother’s daughter. It is in my genes to place some priorities above housework, firmly believing that this is good for my soul as well as the souls of those around me. My mother and Scamp in a more characteristic pose, resting up from reading. In response to The Daily Post’s writing prompt: “I’ve Become My Parents.” Do you ever find yourself doing something your parents used to do when you were a kid? This entry was posted in Family, Mothers and tagged " books, a, Daily Post, Daily Prompt, Family, family memories, housework, inherited tendencies, Mother, Reading on September 20, 2015 by lifelessons. I dreamed last night that we were clearing out my mother’s house. The front doors of all the kitchen cabinets had been removed and I was puzzled about this. 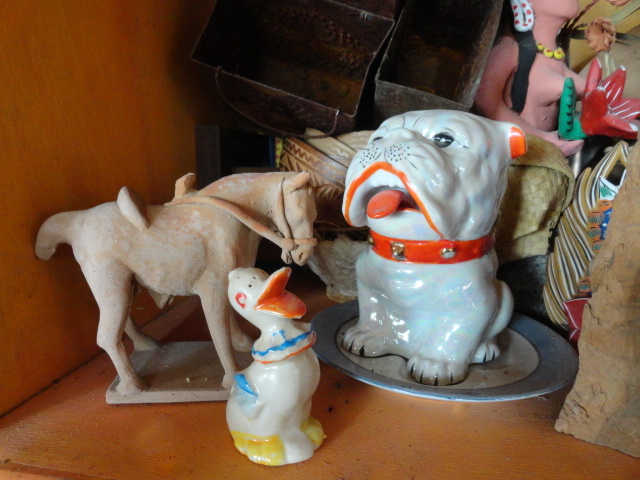 On the mantelpiece, I found China bulldog after China bulldog that was a replica of one I one my mother had told me to take home with me when I cleared out the house after my father’s death. “Judy asked for this. You can fight over the rest.” said a note taped to the bottom. A mayonnaise jar, it was of white glazed ceramic that had a rainbow sheen. Its head came off as a lid and its bright orange tongue was the handle of a spoon. The body fit into a depression in its saucer that had the outline of the bulldog’s feet and bottom so it nested a bit. One of my first memories was seeing it sitting on the small triangular shelf in our kitchen. My mother never used it and later, in newer houses where it didn’t suit the decor, it always sat within a cupboard. 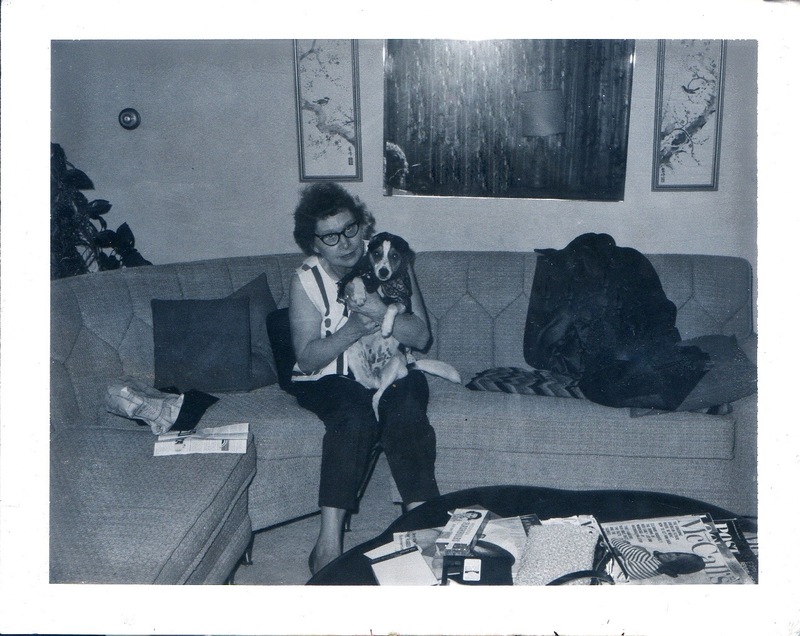 My mother was too modern for China cabinets or knickknacks that didn’t match the color scheme. When I was small, her taste went to magenta and chartreuse. Beige and pink and turquoise marked the seventies, the turquoise and pink traded in for avocado and burnt orange in the eighties and back to a more understated green and beige in the nineties. Whatever the color scheme, the bulldog never quite fit in, but it was the one object asked about by both of my sisters after the Loma Prieta earthquake. I I was living in a house near its epicenter, and the bulldog had worked its way from the back of my kitchen cupboard to sit teetering on the edge, but it had not fallen. It was one of the few things in a house packed full of art and artful objects that I chose to bring with me to Mexico. I’d like to say that it has assumed a position of importance in my house in Mexico, but sadly, the China bulldog just never quite seems to fit in to the mainstream. It has sat on a shelf in my studio for the past twelve years, somewhere near the back where it is safe but unseen. But for some reason, if I were to be able to take one more object from my house, the China bulldog is what my mind falls upon. Perhaps it is time to think about why. I often dream about a subject that ends up being my blog topic for the next day. For some reason that topic fits into the prompt and so it is never very difficult for me to begin the day’s writing. In this case, once I’d settled on the bulldog as my topic, I immediately remembered that in my dream I had found five or six bulldogs on my mother’s mantel. Some were without bodies, all without their dishes. Some were smaller than others and lacked the brilliant sheen or bright colors. One seemed to be almost crumbling, as though it had been under water for a long period. All were missing their tongues. In the dream, I imagined my mother combing second hand stores and never being able to resist whenever she found a bulldog in the same shape as the one her older sister had given her when she was a child. It’s been at least 100 years since she received that strange gift that was the only remaining thing that seemed to have been brought with her when she moved first from Missouri, then to Kansas and then to South Dakota, to marry my father. She told me no stories about it and as I think about that, I realize she told me few stories at all. Not about her wedding or my birth. The stories in my family all centered around my father while her stories seemed safely tucked away on a shelf like the China Bulldog. Perhaps that is why that one piece of all the pieces of my mother has assumed a center place in our memories. I know that my middle sister, who lived in the same town as my mother for the last six years of her life, has mourned her loss the most over the years. My oldest sister, who was estranged from Mom for the last twenty years of her life, is in the throes of Alzheimer’s and so never mentions her at all. It has been fourteen years since her death and I don’t think of her daily or even weekly, but every so often, something happens and the thought comes in a flash that I have to be sure to tell Mother about it; and for the past year, most of my poetry has been written in her joking, rhythmic cadence and rhyme. Perhaps some essence of her that has been steeping in me for over sixty years has suddenly reached its saturation point and must come out. And the China bulldog? The dream? It is as though for all these years she has been trying to get it back, never quite replacing it but nonetheless not giving up the search. And I can’t overlook the irony that it is these less perfect incomplete bulldogs that she chose to put on her mantel. Is she trying to tell me something about beauty or the adherence to a dream or about giving up perfection to enter back into the quest? My mind ricochets without finding an answer, but I continue to feel the prompt. Perhaps there is reason in the name “wordpress.” I feel that press to find meaning through words as I feel my mother’s gentle prod and communication through genes or memory or dreams, to leave perfect things behind and to get on with my life. The Prompt: Burnt—Remember the prompt where your home was on fire and you got to save five items? That means you left a lot of stuff behind. What are the things you wish you could have taken, but had to leave behind? This entry was posted in Dreams, family relationships, Material things, memoir, memories, Mother, Mothers, Wordpress Daily Prompt and tagged art, Daily Life, Daily Post, Daily Prompt, Dreams, Family relationships, Judy Dykstra-Brown, judy dykstra-brown essay, material girl, material things, memories, Mothers, The China Dog, Wordpress Daily Prompt on January 30, 2015 by lifelessons.